A Bnei Brak parlor meeting provides a window into Bennett and Shaked's efforts to target moderate haredim. Senior New Right lawmaker Ayelet Shaked recently held a parlor meeting in Bnei Brak in an effort to make inroads in the haredi community. According to the Walla report, Shaked and New Right leader Naftali Bennett view 'working haredim', who are thought to be more moderate than their haredi counterparts, as potential voters for their fledgling party ahead of the April elections. "The New Right can definitely be a home for working haredim who want to integrate into society," said Shaked. "We are promoting haredi integration into the workforce. This is the most important thing from our perspective, more than drafting [into the IDF]." Shaked highlighted Bennett's effort to "promote haredi tracks in academia with gender separation despite great opposition from media and academia". "We work with them and even if there are differences of opinion," added Shaked when asked about her relations with haredi legislators. "Things are conducted out of understanding and dialogue and there is room for haredi representatives in our party." During the meeting, Shaked also called the Likud the "fake right" for "supporting the Gaza disengagement". 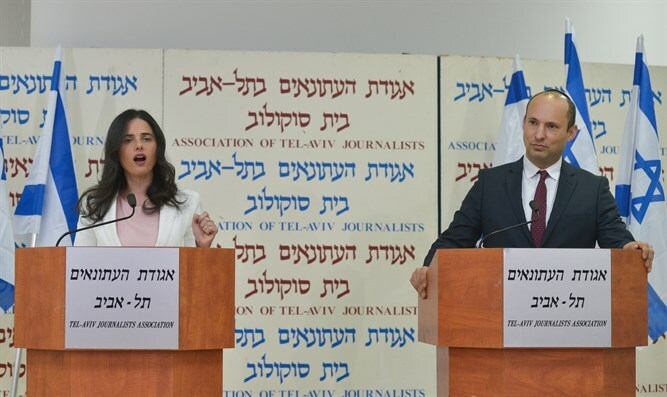 Last month, Bennett and Shaked announced that they would be breaking away from the Jewish Home and forming a new faction, called the New Right (HaYamin Hahadash). While the party could join with the Jewish Home in an alliance after the April 9th vote, the New Right will compete against the Jewish Home in the elections for the 21st Knesset. Since the breakup, the New Right is reportedly aiming to pick off votes from Benny Gantz's 'Hosen L'Yisrael' and Yair Lapid's Yesh Atid party. Israel Hayom reported earlier in January that Bennett told close associates that the New Right would seek to expand the right-wing bloc instead of cannibalizing votes from the Likud and the Jewish Home.